Houston is busy, exciting city. As the most populous city in Texas with a population of over 2.3 million, you can bet that there's always people celebrating something! Houston is more than just big, however. The city was incorporated in 1837, so it's full of rich history and culture, and as one of today's major city's, there's plenty of modern attractions to enjoy. To put it simply, this is an incredible city on all fronts. When you hit the town, do it in style worth of this great city! 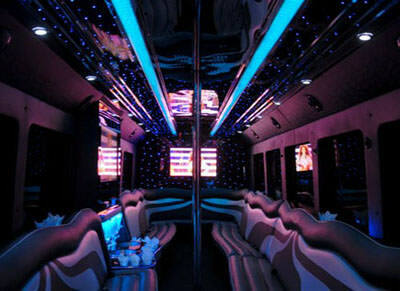 If you live in Houston ,Texas and need luxury transportation then Party Bus Houston is the company that you want to call. We have the most professional drivers and nicest limousines and buses in the Houston area. We service everywhere outside of the city as well and will travel to just about anywhere in Texas that you want to go. We are the perfect company for any occasion that you may have. We specialize in providing luxurious, reliable transportation for all types of events, including sporting events, weddings, concerts, bachelor parties, and bachelorette parties. We supply ice in our coolers located inside of the bus and also supply cups. Although we specialize in the above events, we can also accommodate you for just about any occasion that you may need service for. We like to do things big in the south, especially in Texas, so people enjoy our service because we offer a wide array of vehicle sizes and options. The booking process is simple. If you are interested in finding out more, please don't hesitate to e-mail info@partybushouston.com or to call us at 713-487-5442. All you have to do is supply us with a minimal information and we'll be happy to give you a 100% risk free quote. As you can see from the example above, our vehicles are spacious and have gorgeous custom-designed interiors with leather seats, colorful lights, TVs, built in bar-areas, and so much more! You'll also find there are DVD players, CD players, places to plug in your phone or iPod, and outstanding sound systems! If you want to dance, there's plenty of room and even a pole! There's no finer way to travel. One of the most popular events we provide service for is simple bar hopping! It's important to have a designated driver if you plan to spend a night out drinking with friends, but it's better to have a designated driver with a luxury vehicle! 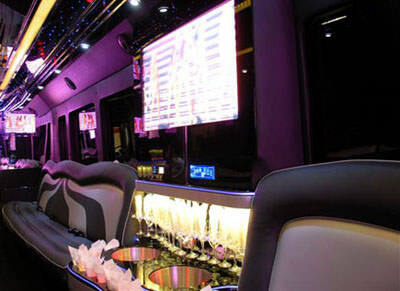 Our limo buses are just what you need. We can take you from bar to bar, no matter how much distance in between, and you'll arrive safely, plus you can keep the drinking going as your travel between destinations, something our clients especially love if they're headed to a new place far away. Your elegant nuptials require the finest transportation, and that's exactly what we've got to offer. Our Houston limos are just what you need for elegant and luxurious wedding day transportation. Our professional chauffeurs will arrive on time and provide you with the friendliest service. They'll make sure your day goes according to plan from beginning to end. From your ceremony to your photo locations to your reception, and even for guest shuttle if needed, you can count on us to provide great wedding limo transportation! In this city with so much history and culture, there's countless attractions throughout the city. From Museum of Natural Science to the Museum of Fine Arts, NASA's Space Center, to the quirky Beer Can House. There's also countless dining options for music and theater, including the Alley Theatre, Theatre Under The Stars, and the Houston Grand Opera, Ballet, and Symphony Orchestra. There's never a dull moment! 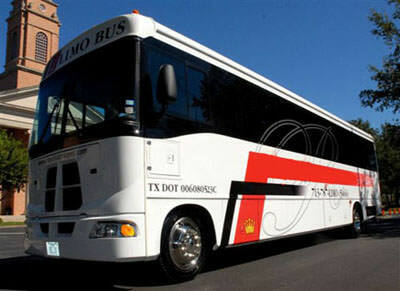 Our luxury vehicles are the perfect way to travel around and enjoy the sights and sounds of Texas! Corporate conferences and conventions are another one of our specialties! Whether you're looking for car service to pick up colleagues at the air port or a way to shuttle a large amount of guests from a hotel to a conference center, we can offer you the finest vehicles to provide said service. Our custom fleet of vehicles will surely impress your colleagues while providing them with total comfort for their travels. Call or email us today to find out how our services can cater to your professional needs. Are you turning one year older? We provide fun transportation services for birthday parties for all ages! Whether you're turning 12 or 21, a party bus is a fantastic way to travel to your celebration destinations! No matter how many friends and family you invite to celebrate your day with you, we have a vehicle that can accommodate all of your passengers. You can start the party as soon as you're on board the vehicle, enjoying drinks, dancing, music, and movies! This will be a birthday you will never forget! You don't need us to tell you how much fun concerts are, but have you ever gone to a live music event in a luxurious limo? Whether your favorite band will be playing at the Revention Music Center, Warehouse Live, or even out in Austin, let us take you in style! It's especially a great way to travel because you can relax and blast your favorite music while you head to the show and if there's heavy traffic or nightmare parking, you'll simply be enjoying your ride and will be dropped off at the door!